In early 2008, the two brands came together with a single objective – make fitness fun again for women. They embarked on a journey to create an inspirational workout that would shake up and invigorate a woman's gym routine. After eight months of development and rigorous testing JUKARI Fit to Fly was ready. Says Uli Becker, President of Reebok, "Reebok has a strong history in women's fitness, and Cirque du Soleil is world renowned for creativity and innovation. Together, the combination of our unique DNA creates a first-of-its-kind partnership to change the way women experience the gym." 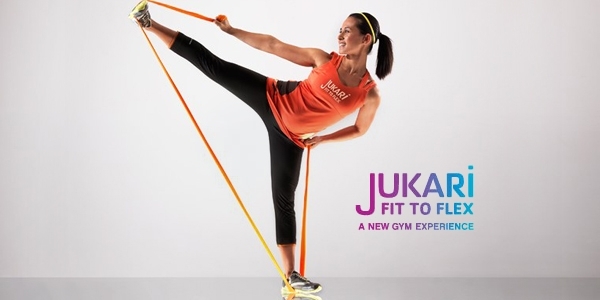 JUKARI Fit to Fly makes fitness fun again by introducing a new way to move in a gym workout and is accessible to all women, regardless of fitness levels. The hour-long workout has been created on a specially-designed piece of equipment called the FlySet. The result is a workout that gives the sensation of flying while strengthening and lengthening the body through cardio, strength, balance and core training. The class will launch in top gyms in fourteen cities around the world: Sport Club (Buenos Aries, Argentina), Balthus (Santiago, Chile), World Gym (Seoul, Korea), Pure Fitness (Central, Hong Kong), CHI Fitness by Clark Hatch International (Kuala Lumpur, Malaysia), Reebok Sports Club Madrid (Madrid, Spain), Reebok Sports Club Canary Wharf (London, U.K.), Pure Fitness & Health (Krakow, Poland), Body and Soul - Brunnthal (Munich, Germany), Gym du Plateau, Mansfield Club, Club Sportif MAA (Montreal, Canada), Custom Designed Reebok Gym Exclusively for Celebrities (Los Angeles, CA), Reebok World Headquarters Gym (Boston, MA), and Equinox Fitness (New York City, NY). The Reebok-Cirque du Soleil partnership and JUKARI Fit to Fly workout are the direct result of insights into what women really want from exercise. A survey1 of 15,000 women across 25 countries in 2008 found that while nearly half of all women know that exercise and keeping fit is very important to their overall health, less than 25% participate in fitness often. Specially-commissioned Reebok research looked at why this might be. The findings showed that nearly two thirds (61%) of all women would workout more if it was more fun. More than half (54%) felt exercise was a chore. JUKARI Fit to Fly isn’t just fun to take part in, it is an effective hour-long total body workout of cardio, strength, balance and core training. 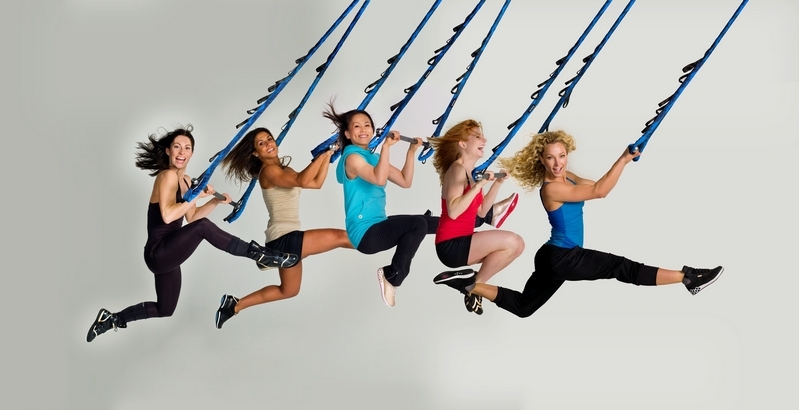 A trained instructor guides a class of up to 12 people through the workout moves4 using the FlySet. The FlySet hangs from the gym ceiling and has been designed specifically for JUKARI Fit to Fly. The FlySet consists of a durable three-stranded rope fixed to the ceiling with a 360 degree swivel point at an adjustable length with two attachment loops. The FlyBar, a 4.5lb neoprene coated attachable steel bar, is placed through the two loops, which can be varied in height, to create an apparatus that strengthens and lengthens the body as you experience the sensation of flying during the workout. Most of Jukari’s signature moves are trapeze-like which involves swinging around and being suspended on air defying gravity. 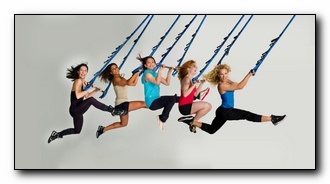 It is the reverse way of getting fit when compared to other gym workouts as with Jukari Fit to Fly you work with an equipment called a FlySet which hangs from the gym’s ceiling and not attached to its floor. Still, Louise Sutton, head of the Carnegie Centre for Sports Performance and Wellbeing at Leeds Metropolitan University, explained that being suspended on air can actually help you relieve tension in different parts of your body. She added that a person’s core muscles “tend to work extra-hard just to keep you in that suspended position.”Among the Jukari signature moves is the “Swing to Straddle Jump” which is actually considered a cardio movement that works on your legs, lats and biceps; the “Lunge with Kick” which works out on your legs and core; the “Hanging Carousel to Straddle” which targets your abductors, lats and abdominals; the “Mountain Climber to Pike” which works chest, triceps, shoulders and core; the “Swing to Tuck Jump” which works on your leg muscles; and the “Mixed Grip Pull-up with Kick” which works the chest, back and legs.